Are you are fond of bar recipes as I am? These easy dessert ideas are a boon to any busy cook. They come together quickly and your family and friends will love them. 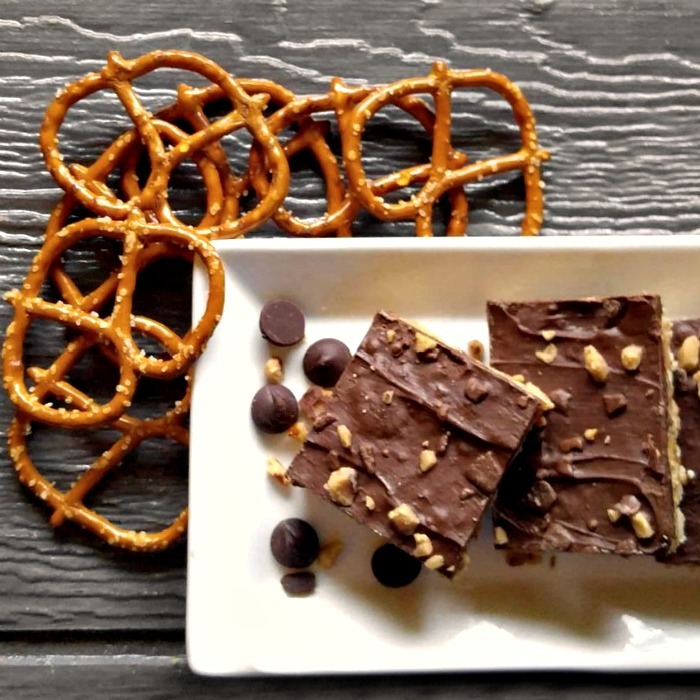 These no bake chocolate toffee peanut butter pretzel bars are my latest sweet treat and they mimic two of my favorite types of candy. I love both Heath Bars and Reese’s peanut butter cups and my sweet tooth was asking for one of these delicious tastes (or both!) I gave in and came up with a twofer concoction that satisfies both of my cravings. 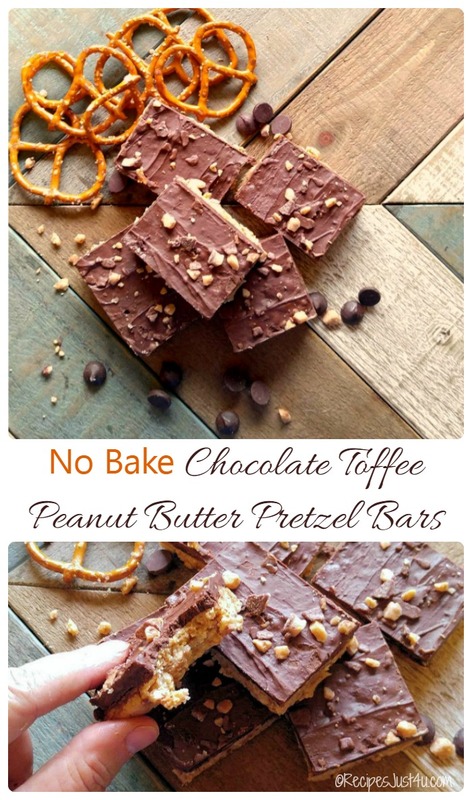 Sweet tooth sensation – No bake chocolate toffee peanut butter pretzel bars. Having one of my favorite candy tastes in a bar is nice. Using two is over the top decadent, thank you very much! 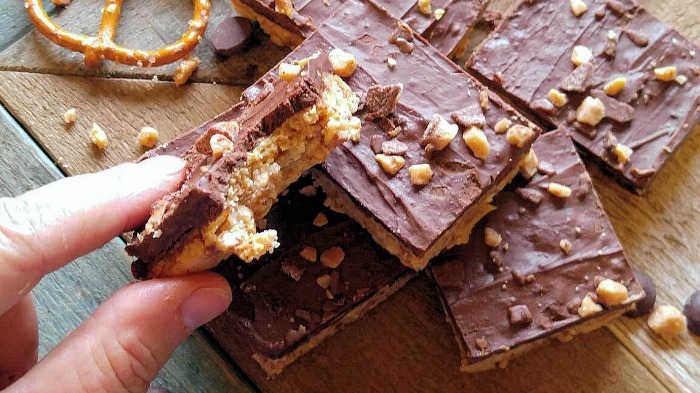 These delicious bars are TO DIE FOR. They have the taste of a peanut butter cup with with a salty base made from crushed pretzels. 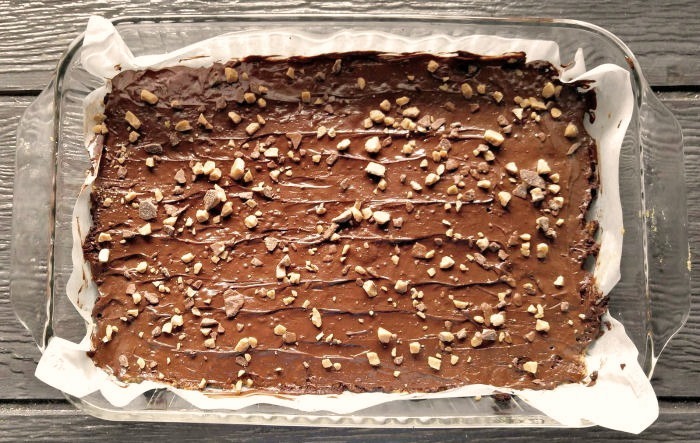 The topping is rich and decadent and has the added crunch so typical of the Heath candy bar. They are a match made in peanut butter toffee pretzel heaven, if there is such a place. 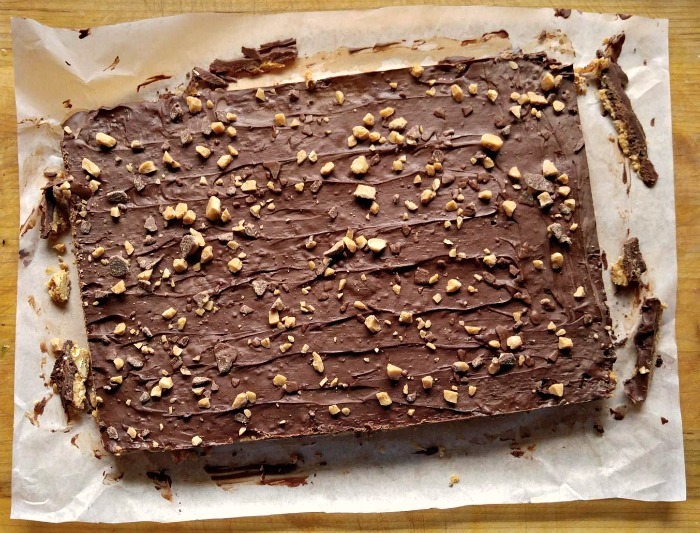 These no bake chocolate toffee peanut butter pretzel bars are so ridiculously easy to make that even a child could prepare them. But there is one HUGE problem with them. Once you take a bit (or five) to sample them, they will be devoured in a “I’m seriously going to eat the whole pan of them, if you don’t get them out of my house” moment. Just look at what goes into these bars! I mean, seriously…can we say tempting on the count of three? 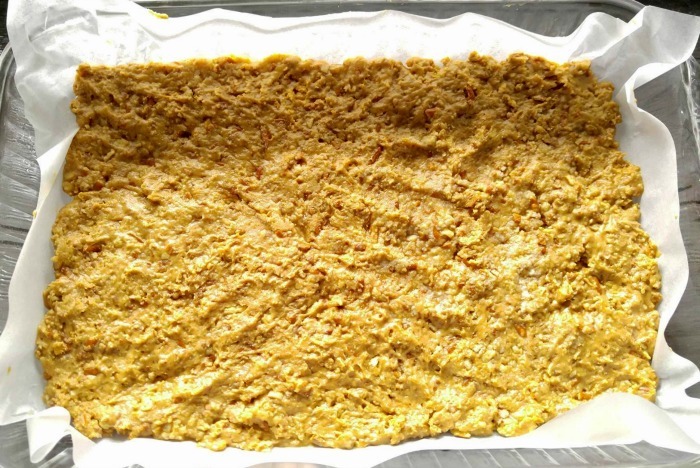 Start by lining a 9 x 13″:pan with parchment paper. Allow some extra paper on the edges to give you a handle to make the bars easier to remove later. I also sprayed my parchment paper with my Misto sprayer to make it extra easy to take out the bars. The next step is to crush the pretzels. 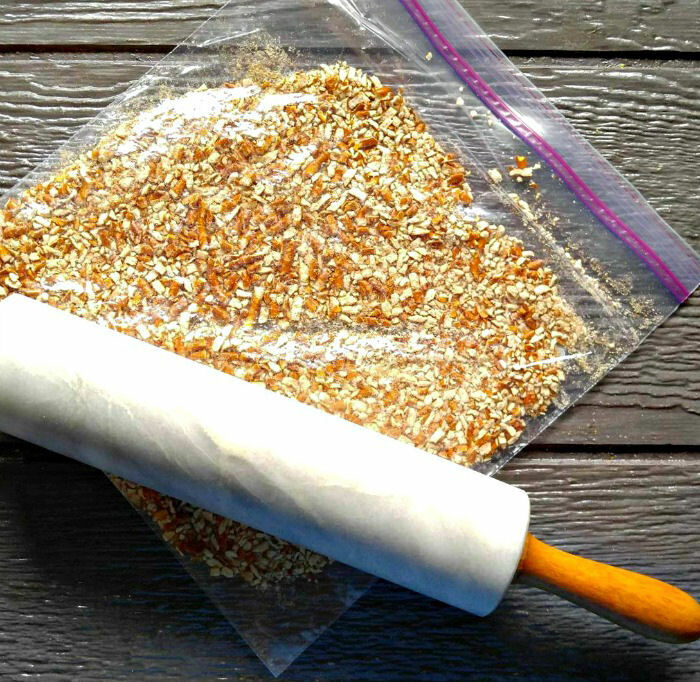 You can use a food processor to do the job, but I have had a hard week, so I took my frustration out on the pretzels with a heavy marble rollling pin that I bought recently on one of my antique hunting day trips! A few rolls of it and the pretzels were the perfect consistency for my base layer. Combine the crushed pretzels, melted butter, powdered sugar and Jif reduced fat creamy peanut butter in a large bowl. The mixture will be sticky, but don’t worry, it will set when you put it in the fridge to cool after adding the chocolate layer. Press the mixture into the prepared baking dish. I put the dish in the fridge while I made the topping to give it a head start on setting, since I somehow just knew I was going to want to dive in and sample this LONG BEFORE it had time to set properly. Don’t judge…I know my personality!!! THIS is the reason I line my pans with parchment paper. The whole thing came out in one piece. I just trimmed the edges and the bars are ready to slice into pieces. Try doing that with an unlined pan – I challenge you! This pan makes 24 bars, or 18 if you have an extra sweet tooth. Calorie count is 265 each for 24 bars or 354 for 18 bars. I don’t dare tell you how many the whole pan is. Have some restraint, girl! These are, hands down, the best bar dessert I have made. They are rich, but not overly so, crunchy and salty and creamy, and the adjectives could go on and on. Take one bite, and you’ll want the whole pan. The good news is that they freeze well. So, unless you find yourself raiding the deep freeze in the middle of the night, it is possible to have them in the house and not totally wreck your diet. 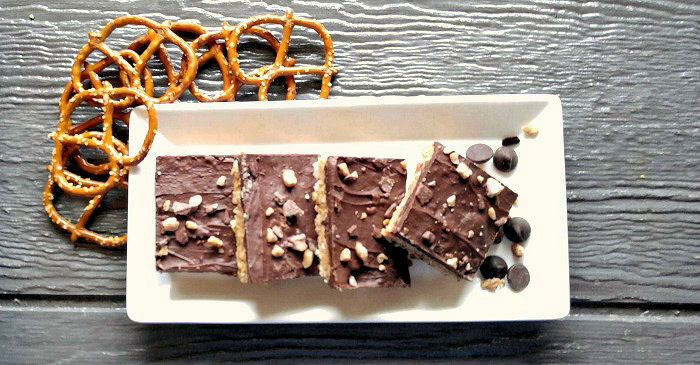 Time to go sample one (or two…) of these scrumptious chocolate toffee peanut butter pretzel bars. I deserve it after the week I have had! For another tasty pretzel recipe, check out these pretzel crusted chicken tenders. 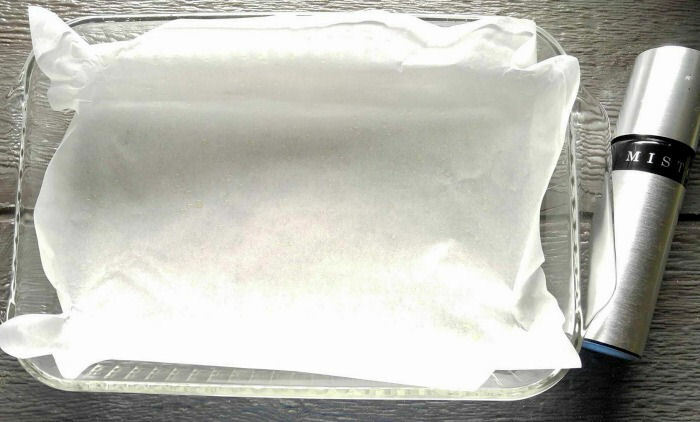 Line a 9 x 13" pan with parchment paper and spray with non stick cooking spray. 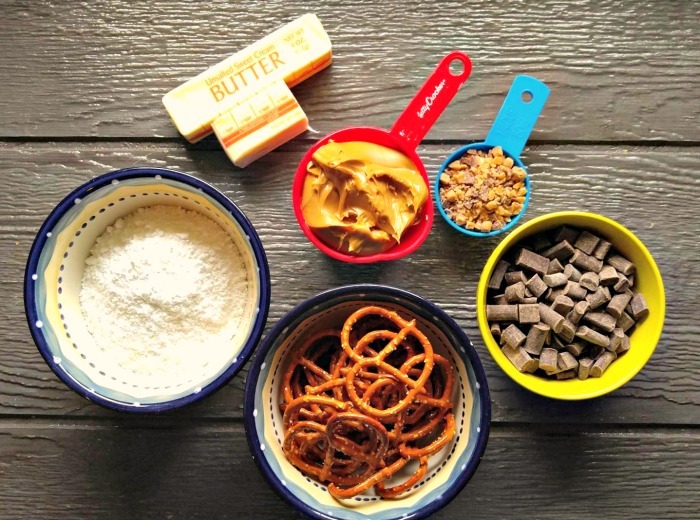 Place the melted butter, pretzels, powdered sugar, and peanut butter in a large bowl. Mix by hand until well combined. Press firmly into the prepared pan. 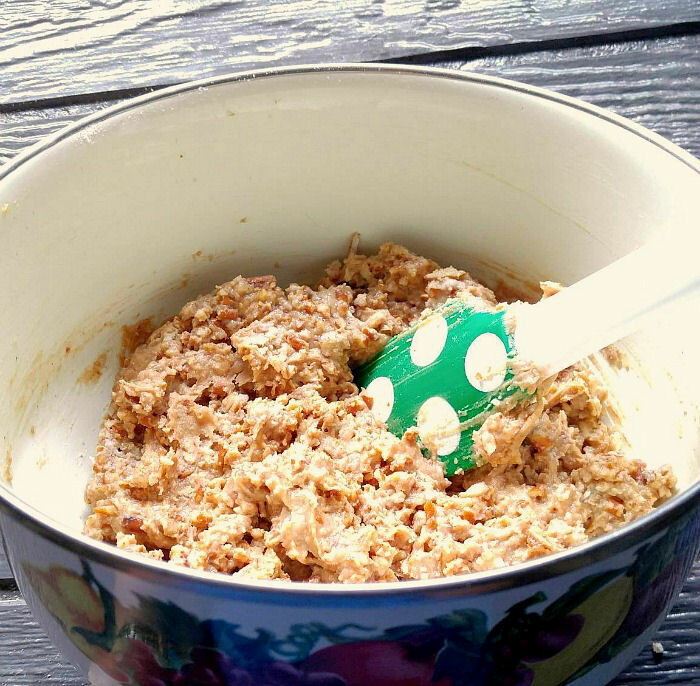 Place the chocolate chips and 1/4 cup peanut butter in a microwave-safe bowl. Heat on HIGH in 30 second increments, stirring often, until the chocolate has melted and the mixture is smooth. Spoon the topping over the bars and spread with a spatula to coat. Sprinkle with the Heath toffee bits. Chill for at least 1 hour to set, then slice into 24 bars. These bars can be stored in an airtight container in the fridge. Can also be stored at room temp if your home is not too warm. That is where the freezer comes in handy. They are TOO good.